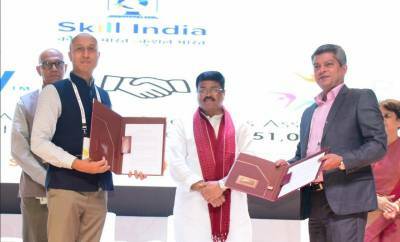 In line with the Government’s “Skill India” initiative, Amway India, the country’s largest direct selling FMCG Company has inked a Memorandum of Understanding with Retailers Association’s Skill Council of India (RASCI) to renew its partnership for the second year in a row. The renewal of association with RASCI is a step further for Amway reiterating its alignment closely with Government’s “Skill India” initiative and is a part of Amway’s broader vision of empowering its direct sellers with credible certification under National Skill Qualification Framework (NSQF) from an esteemed Government recognized entity like RASCI. The association began last year. Rajat Banerji, Vice President, Corporate Affairs, Amway India and James A. Raphael, Executive Head, RASCI signed the MOU in presence of Shri Dharmendra Pradhan, Hon’ble Minister of Skill Development & Entrepreneurship, Govt of India on the occasion of 3rd anniversary of Skill India. Signing of this MoU will enable Amway India to extend the free training for upskilling of its direct sellers for the second year in a row. Fifty-One thousand direct sellers and retailers will be benefitted and certified under two categories of ‘Individual Sales Professional and ‘Retail Sales Associate’. Last year, more than six thousand Amway direct sellers were certified as ‘Individual Sales Professional’ under this program. 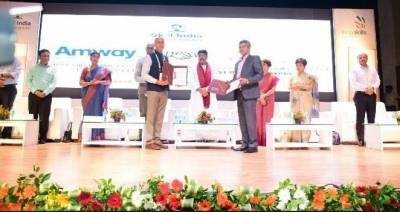 Amway India has significantly contributed towards skill development and nurturing entrepreneurship in the country by focusing its training strategy on enhancing skills and competencies of its direct sellers. The company conducts more than 18,000 free training sessions for its direct sellers every year, which enables them to engage and educate the customers, and offer right products to them to suit their varied needs. It is estimated that more than eight million jobs are required every year for India as its working-age population is increasing by 1.3 million every month according to world bank report. On the contrary 7 million jobs are being created annually. There is a huge gap in employment in this country. To address this huge gap, Govt of India is driving entrepreneurship and self-employment through skilling. Amway India is aligned with Govt of India’s initiative as the company has led a silent revolution by encouraging more than 5.5 lakh individuals to take up entrepreneurship as a way of living. With zero capital investment and no burden of manufacturing, a direct seller can build his own business with ease. Looking at the exponential growth of India’s youth population, and with nearly two thirds of the population under the age of 35 years, the growing young workforce in India will soon be the largest and youngest of the world. It is estimated that only 4.69% of the total workforce in India has undergone formal skill training as compared to European and American countries. The absence of adequate training channels in the country limits people from entering the workforce to acquire skill trainings and certifications. As a result, majority of the workforce gains skills through informal means which go unrecognized across formal platforms and industries. This also restricts them to explore any formal employment opportunities. In 2017, Amway India also partnered with IIM-C to offer a special course focused on entrepreneurship and leadership for its identified high potential direct sellers. Amway has also started working with U-35, targeting students in universities by training them with life skills which will help them foster a learning mindset, take value-based decisions and embrace future with confidence. *RASCI is an autonomous industry-led body that is chosen by National Skill Development Corporation (NSDC) that is responsible for creating National Occupational Standards (NOS) for retail industry, developing competency framework, conducting Train the Trainer (ToT) and Assessor (ToA) Programs, conducting skill gap studies, and assessing and certifying trainees on the curriculum aligned to the National Occupational Standards. Amway India launched ‘Persona Germ Protection and Moisturizing’ liquid hand wash.